This season of Bigg Boss 10 is finally coming to an end and we are just few days away from the grand finale of the high voltage reality show. It will happen on 28th January and India will get it’s Bigg Boss 10 winner. While Manveer won the ‘Ticket To Finale’ and has become the first finalist of Bigg Boss 10, we still had five nominated contestants– Bani J, Mona Lisa, Nitibha Kaul, Lopamudra Raut and Rohan Mehra. We recently informed you about the sudden midnight eviction which surprised everyone where the housemates who were half-slept were made to assemble in the garden area for eviction. And we exclusively revealed that commoner contestant Nitibha Kaul will be out of the show. 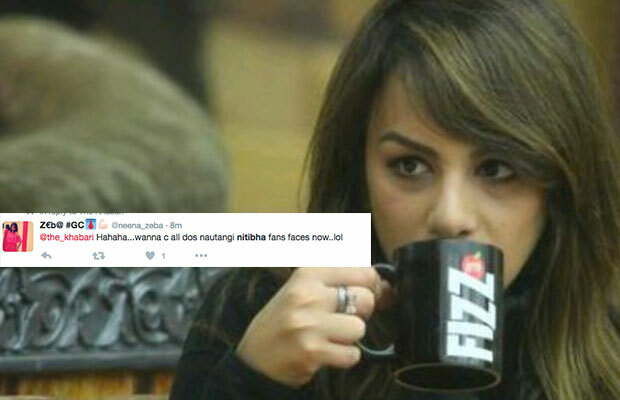 After Nitibha got evicted from the Bigg Boss house, the fans of the show reacted to her eviction. While the majority of them were happy because they wanted her to be out of the show, there were some who were shocked about it. Surprisingly, Nitibha was also in shock, not about her eviction but about how she managed to survive in the house for so many weeks. Tell us your views about this sudden eviction and stay tune for all the updates on Bigg Boss 10.